A locally developed application has combined computer software and hardware to help visually impaired people interact better with the physical environment around them. The product won commercial recognition by differently-able people even during the research stage. Called the “i-Chum”, this application utilises sonar (sound navigation and ranging) and motion sensors to identify the presence of physical objects, like benches, for example, and inform users of how close they are to these objects. 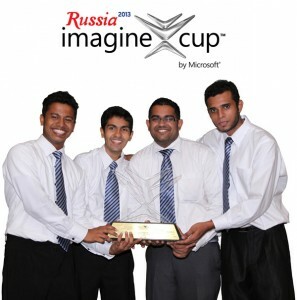 Developed by a team from the Informatics Institute of Technology in Wellawatte, for the local leg of this year’s Microsoft Imagine Cup, ‘i-Chum’ will be representing Sri Lanka at the grand finals of the “Innovation Competition” category, which will be fought out in July in St. Petersburg, Russia. The team won the local competition held last week. According to the application developers, Team Firebird, which comprises B.K. Mohamed Shehan, Stefan Udumalagala, Amal Gunathilake and Kishore Kumar Ganeshalingam; “The product i-Chum is all about removing barriers faced by visually impaired and helping to lead a normal and productive life. It’s a quantum leap in augmented sensory aids for the blind, allowing them to experience both the physical and virtual environments in a way without compromising their safety”. In response to a query by the Business Times, about how they came up with the idea, the team commented as a group, stating; “When we applied to take part in the competition we researched about the gaps in current society where technology could actually help to improve lifestyles. And we found out that still there aren’t proper technologies developed to help the blind. So our team had a brainstorming session, put our thoughts and knowledge together and came up with a perfect product which contains the latest technologies”. Continuing, the team also noted; “On our visit to the Deaf & Blind school (at Ratmalana) to research more on the product and to get the feedback from the visually impaired people, they were amazed with the product and they were willing to buy the product at that moment. But we said it’s still at the research level and we are improving the product furthermore to the final competition, and once we develop the complete product, we will put the product out to the market. They said ‘whether we win or lose the competition… Please develop the whole product as soon as possible and put it to market! They are willing to buy it.’ So after the grand finals we are going to put the product out to the market as soon as possible”.